Thanks to reader Jennifer M., I've recently learned that not all of my future dream doors can be like this Star Trek door. This kind of thing makes me unreasonably happy. I like that. See more goodies at Cinder's store here. So tell me, guys: what's making you smile today? Share your links in the comments! I love the video and have already watched it twice since you posted. :) Have you gotten a gander at the Star Wars Vinylmation series yet? I don't think I quite understand the vinylmation fad yet, so I can't tell if I like the figures or just the idea of them. and it's viewable for people outside the US (at least for now, these things tend to change). Hahahaha !!! Just sent to a friend who is a keyboardist for a 70s cover band. He's gonna LOVE it !!! Thanks for making me :) today. Hubby and I are signing up for Green B.E.A.N. Delivery (fresh foods from local farmers delivered to you every other week). I visit those icanhascheezburger sites (a guilty pleasure) and my favorite one is the Wedinator site. 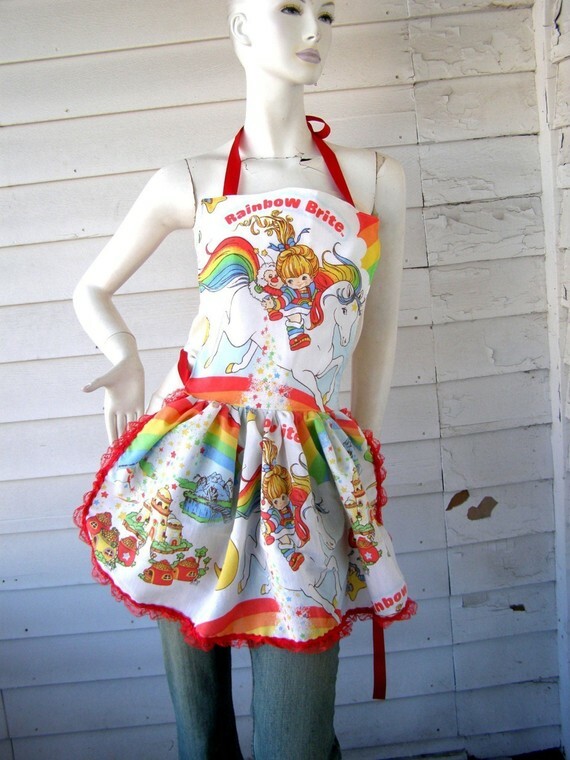 Rainbow Brite apron = WANT! a) I love your blogs...they make me smile on a daily basis! Also, this video has made me laugh lately! The website I recently discovered that makes me cry from laughing so hard is http://damnyouautocorrect.com/ - if you haven't seen it, I highly recommend it! And thanks for this post, Jen - that video rocks! Oh goodness!! I love every single thing in this post!! 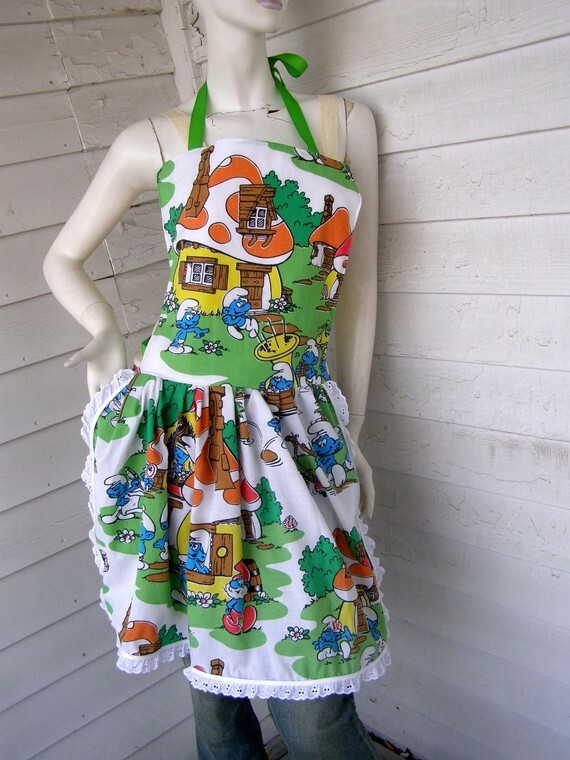 May be clicking over to buy the apron. Immediately. TARDIS DOOR. MUST HAVE. Then I will be immensely happy every time I walk into that room - it's bigger on the inside! So, this link makes me happy. This is my friend Nick Jimenez, who is a talented actor/writer/director/improv-er, etc. He wrote a book called "Queen Witch", and is releasing it chapter by chapter as an audio book. Not only is the writing good, but the narration style is hysterical. Fans of Buffy the Vampire Slayer might really get into this. It's kind of long, but worth checking out. My friend could really use the viewers! Hello LP. I know it has been a long while since you last saw a post from me. But I knew this was one of my 1st places to post for help. On Christmas Eve my sister was told the devistating news that her 6 yr old baby girl has cancer. Since then many tests have been done and on Thursday we were told the results. C***** has High Risk Neuroblastom Stage 4-- less then 30% survival rate for a child of C*****'s age. Dr gave the statistics of this in C's age range. out of 1 million children 6-10 only 2 will have this type of cancer. C***** has never been to Disneyland. She only has a short window to go (before starting treatment). Jan. 13-16th. We do not have time to go threw Make A Wish or any other wish programs. This is the only time they are able to go, C***** does not know about this just incase Aunt S***** is not able to pull this off. feel free to email me- it is in the profile. If you can not or do not want to donate I understand but please send good wishes, prayers and any thing else you have to our family!! They raised enough money in a matter of hours, and if you go to Laughingplace.com and click on LPlive, you can see pics of "C" from earlier today, getting hugs from princesses. SO much to smile about. Along similar lines, you may enjoy Anamusic's Pipe Dream. Love love LOVE the TARDIS door. I HAVE to do that. That was fabulous!! I can see it it's Taiwan so you are good for at least Asia.. It's still too early in the morning for me to figure out what's making me smile today, I'll get back to you on that! I found this shop while looking for some Peter Pan art for my brother. I fell in LOVE. My friend just linked to this and I thought you'd enjoy it a lot! BUT, instead of reposting it, the next time you're in B&N or Borders, check out Phoenix magazine. The Feb '11 edition has an article called Hidden Home Treasures and talks about how to use things you already have and make them into new stuff. Ironically, they talked about taking old doors and attaching them to a wall and painting it as a decoration, or using chalkboard paint on it to make it into a chalkboard. They can also be cut into sizes for dining tables, coffee tables or end tables--just put a piece of glass on top. I had posted all the projects in the article, but I don't want to retype them. So just check out the magazine or go to www.phoenixmag.com - they will probably post the article by next month. LOVED the video. I have always wanted to tackle stop motion animation, but I don't think I'd have the patience! That is just so fun and cute. I'll probably watch it about a billion times. Oh, and for those vintage sheets: they also make great pet beds, curtains or pillows! So I met my husband's friend's wife-to-be on Saturday, and she is a fellow horror movie fan so she and I hit it off right away. She loves zombie movies, so we were talking about them. Somehow we got into talking about crafts, and I talked about how I do cross stitch, and how I wonder if there are any zombie xstitch patterns out there. So we went to B&N with our other halves that night just to hang in lieu of a movie, and we found a lot of zombie books and graphic novels. Then we started talking about how they should have a Halloween/zombie wedding and it would just be total fun. Well guess what else they had at B&N? This: Zombie Cross-Stitch kit I could NOT believe it. AND there is a pattern in there of a zombie bride and groom that says "Til Death Does Its Part." I cannot wait to make it for their wedding present! Just saw this t-shirt I thought you might like here. That doggie video is adorable. I'll share that with friends! If so, I'm marking it on my calendar, 'cause I want photos! LOVE that door! The aprons are cute! But OMG, that video?! My kids and I have watched it a dozen times since you posted it. When it is not playing, they are singing "Baby, baby" around the house. You've turned us on to a whole new fave music group. Homeschool recess is now dance breaks to Rex the Dog vids. Thank you for expanding our horizons. I had those Rainbow Brite sheets when I was younger! Unfortunately, I think I just got rid of them last year. I had been keeping them in hopes of using them for something (that, and not being able to bear the thought of parting with them for purely nostalgic reasons), but I think the hubs finally guilted me into getting rid of them. I'm going to have to go on a hunt to make sure though. Unfortunately, mine we well-loved & used, so they're not in the greatest condition. Here are two songs that I listen to when I need something to smile about. This one is last year's Eurovision winner, but it's one of happiest songs I've heard (had to special order the album from Germany because I love it so much). I adore the door (heh). 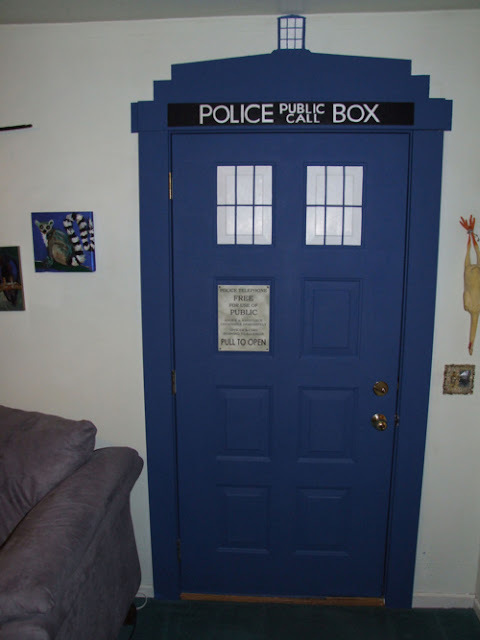 I hope the doorbell makes the "whoosh whoosh" Tardis sound. I love the paper stop-action video! This video has been making me smile for a week or so: http://www.youtube.com/watch?v=y4sOfO8Ei1g -- bouncy music and amazing typographic animation. OMG! I LOVE those aprons! Love, love, love! I still have my Rainbow Brite pillow cases! I love the Dr. Who TARDIS door idea. On the 27th is my PhD dissertation defense and for the occasion my husband got us matching Tshirts. Mine said "I'm the doctor" and his says "The doctor's companion". I am super excited! I love it!!! The retro sheet aprons reminded me of these superhero aprons that I came across Bethany Sew&Sew Squee!!!! Have you seen this got steampunked shirt on Threadless? It's not for sale yet, but you can score it and help it become a t-shirt! That video was so cute! I guess, besides that video, finally buying this year's calender has been my happy bits of the day. Why did my new calender make me happy besides the markdown for being halfway through January? It's Star Trek: TOS! Not only does March, my birth month, have Spock as the picture, it also has the birth dates of the major cast members and other Star Trek related dates marked in. So awesome! I love the video and TOTALLY admire the dude that did it. I have no patience for making stuff like this so I think it is awesome. oooh, 'bruises' by chairlift is making me smile today - I love that tune! The film clip isn't half as cute as yours though! The video was fun. Made me smile this morning. What is truelly making me smile (besides it being my birthday) is my husband and freinds web comic starting in the next few weeks. They've got the preview stuff up, but SOON it will be the first sorty. YAY. It's been years in the coming. Hey Jen, just ran across this on Threadless. Ghostbusters + Steampunk + $5 = Nice buy! After seeing some of the TARDIS crafts on here my wife decided to knit this up. I think it looks awesome! I need the opinion of fellow geektresses. Yesterday my husband and I found out we are having our second little girl, but we hadn't found a name yet. We decided today to name her Kaylee Rose and we LOVE the name. I should mention here that we also totally LOVE Firefly. :D I think it would be so completely adorable to find a pattern of Jayne's hat and have a family member make miniature versions for Kaylee and my 2 year daughter, Alysa. My question is... is having FOUR of them made (one for each of us...) too much? Have I completely gone off the deep end of the nerd sea?? There is not one room in my house where I could put that door and yet I covet it so much! So, so cool. Completely awesome! Poor sick puppy! Let's try this again with proper links! I am in nerd heaven! Look, a steam punk comic! LOVE IT! The video works just fine here in Okinawa, Japan. Trust me though, I do not lead the glamorous forgeign life. The Army sent me here :) Now if you excuse me, I need to go sip my green tea on my balcony, as I watch the sun set over the East China Sea... ;) Oh, and YOU guys make me smile, everyday, so thank you for that!!! I had the Rainbow Brite sheets! My friend does chainmaille. Her New Year's Resolution is to make one thing every day and post pictures. I'm behind in my reader, but I just saw this post and thought you should see this site. Full of win, enjoy! Jen, have you seen La Linea? It's one of the oldest stop-motion things out there. It's Italian and one of my former Italian house mates told me he used to watch it on telly when he was a kid, which dates it at around 20-25 years ago. and browse for many many more!